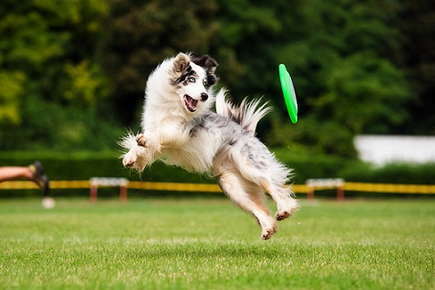 The rupture of the cruciate ligament is the most common knee injury in the dog. This injury has two common presentations. One is the young athletic dog playing roughly who acutely ruptures the ligament and is non-weight bearing on the affected hind leg. The second presentation is the older, overweight dog with weakened or partially torn ligaments that rupture with a slight misstep. In this patient the lameness may be acute or there may be more subtle chronic lameness related to prolonged joint instability. Your veterinarian will perform an orthopedic exam and take radiographs (x-rays) in order to diagnose this injury. The orthopedic exam involves an analysis of the gait, examination of the joint for swelling and/or pain and the presence of "drawer movement" (the presence of forward instability of the knee joint). Sedation is often required to do an adequate evaluation of the knee, especially in large dogs. Sedation prevents the pet from tensing the muscles and temporarily stabilizing the joint and preventing the demonstration of the drawer sign. Radiographs confirm inflammatory changes in the joint and establish the level of osteoarthritic changes present. Surgical repair is recommended in most cases to stabilize the joint and prevent further osteoarthritic changes secondary to the joint instability. There are three primary types of surgical repair: intracapsular, extracapsular, and tibial plateau leveling osteotomy (TPLO). The type of surgical repair will be determined by the size, age and activity level of the pet as well as the degree of osteoarthritis already present in the joint. The recovery time and recommendation for physical therapy will depend on the type of surgical repair performed.